A time-traveling murder mystery that has so much more going on than your typical sci-fi mystery. I read The Gone World for my post-apocalyptic book club and we had a really good discussion on Thursday. The plot is intricate and quite complex. As was mentioned during the discussion, it spans genres and touches on a multitude of topics. So don't write this book off if you aren't interested in time travel or sci-fi. Shannon Moss is a Naval Criminal Investigative Service (NCIS) agent. They have discovered a way to time-travel to various futures and use this to solve murders. During these travels, they have discovered something much more troubling than just catching a killer - the Terminus. The agents privy to this method as tasked with figuring out how to stop the Terminus which wipes out mankind. Shannon discovers links between the murder of a childhood friend and the future Terminus. Can she unravel the mystery before it is too late? Important time points are 1986, 1997 and 2013. Our discussion leader provided some notes about Norse mythology that plays a role in the novel. I'm very thankful for that as I have very little familiarity with Norse mythology. So little in fact that I didn't pick up on it. If this interests you, you may want to explore more about Nagifar or Naglfari, which is the Norse ship of the dead, and Vardøger, which is a predecessor or spirit doppelganger. In addition to Norse mythology, there are other religious themes in the novel. One character in the present often asked Shannon if she believes in the resurrection of life. During the Terminus event, Shannon sees people hanging crucified. There is also the theme of free will versus predestination. Shannon tries to change the future outcome by gathering facts on what led to the event and then manipulating the sequence of events in the present hoping for a different outcome. However, it doesn't always change the final outcome. This is particularly related to Shannon's life. Was she manipulated into being part of this covert-branch of the government? I don't want to say too much since it is part of a big plot twist towards the end of the novel. While the future "blinks out" it is possible to take a person from the future IFT back to the present. The person is referred to as an echo. So there is a lot to explore in the text about who are you, what is real, and a person's role in the future (linked back to the theme of free-will and predestination). And then there is the whole "what is the Terminus" and it could be interrupted differently depending on your own religious belief or worldview. I enjoyed the story and thought it was really well written. I loved that futures are called IFT (pronounced 'ifs') So often in time-travel novels, the future is considered more or less a foregone conclusion. In this story, the futures are definitely treated as possibilities that "blink out" when the time traveler returns to their own time. There are several conversations about the future people's lives ceasing to exist when Shannon leaves. And characters are cognizant that the life they experienced in the future will never happen exactly the same way. At times, this leads to some existential introspection. And a great aspect of the book to discuss with your book club. Unless you can really focus, you may not want to listen to this book. I knew I was missing pieces of the plot (I listen at work and get distracted often) and it was evident during book club that I missed far more than I realized. The Gone World is not a straightforward murder mystery. There is a lot going on between the lines and I think it would have been helpful in getting the deeper meanings being conveyed or catching certain nuances. Or evening some of the more basic aspects. Like, I didn't realize that the present chapters were in third person and the future chapters were in first person. I think listening to it also played a part in my confusion in following the timeline. At one point, I had a flashback of all the discussion following Harry Potter and the Prisoner of Azkaban and time- turners. Though some things became clearer at the end so part of the confusion is inherent in the text (and probably the intention of the author). That being said. I thought the narrator did a great job reading the story. And it is a lovely long audio recording - more than 13 hours. On a sort of side note, one of the reasons I thought it would be fun to read this novel is because I love the television show NCIS and there is a throwaway pop culture reference to Gibbs which made me smile. Another pop culture reference that I wish we had discussed at book club was Shannon's love of the television show The X-Files. 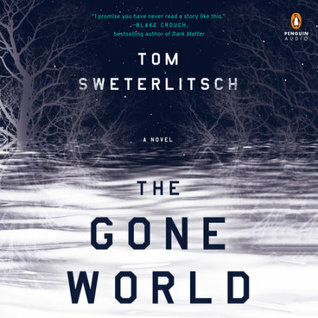 If you are looking for a book with a lot of layers, that will make you think about the world around you, then you will definitely want to pick up The Gone World. Oh! This sounds AWESOME! Thanks for putting it on my radar!